Recently I made a similar card and got a few requests on how I created this effect. So, I decided to remake it. I love pine leaves, cones and berries at this time of the year, so these stamps are perfect as the leaf cluster is really pretty and dainty and so are the cones…perfect shape and size. 1. 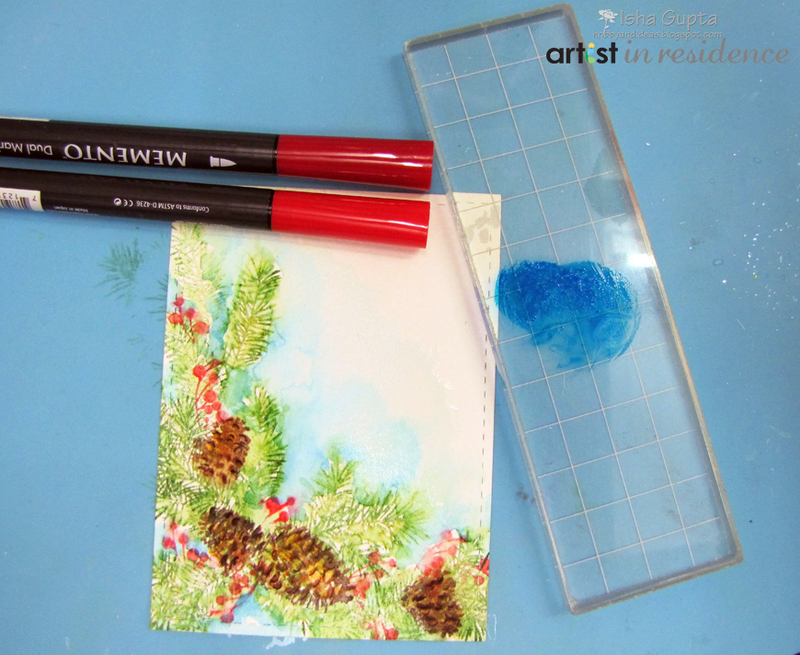 Ink the pine leaves using Memento Markers in Bamboo Leaves and Cottage Ivy. Stamp it twice onto the watercolor mat layer. Lightly spritz with Ink Potion No.9 onto an acrylic block. Dip the brush and just dab onto the stamped images. 2. Ink and stamp the cones using Peanut Brittle and Rich Cocoa Memento Markers in a similar way as step 1 but only stamp once. Dab with a brush dipped in Ink Potion No.9as before to lightly blend the colors together. 3. Ink the berries partially with lady Bug and Rhubarb Stalk markers, then stamp and dab with a damp brush. 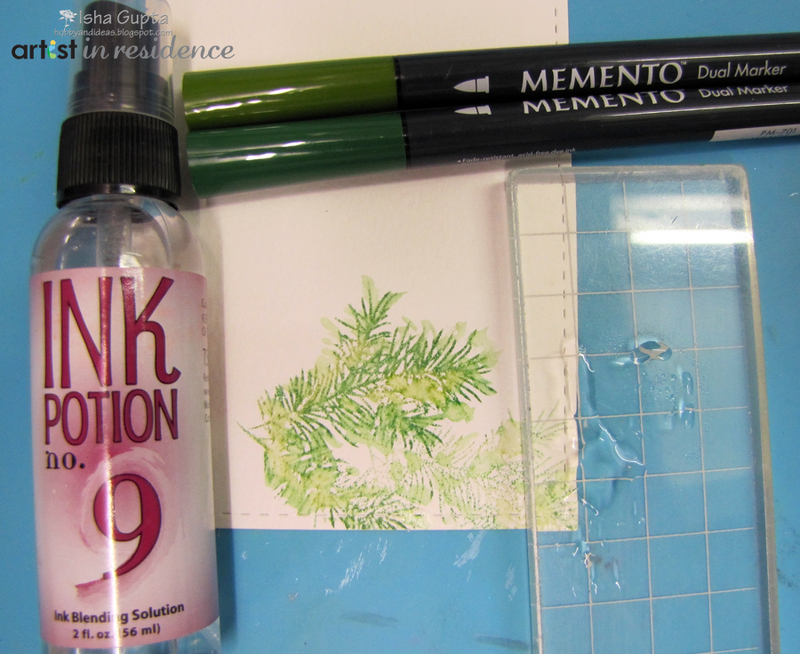 Dab some ink onto acrylic block and apply around the stamped images using Ink Potion No.9 for blending. 4. 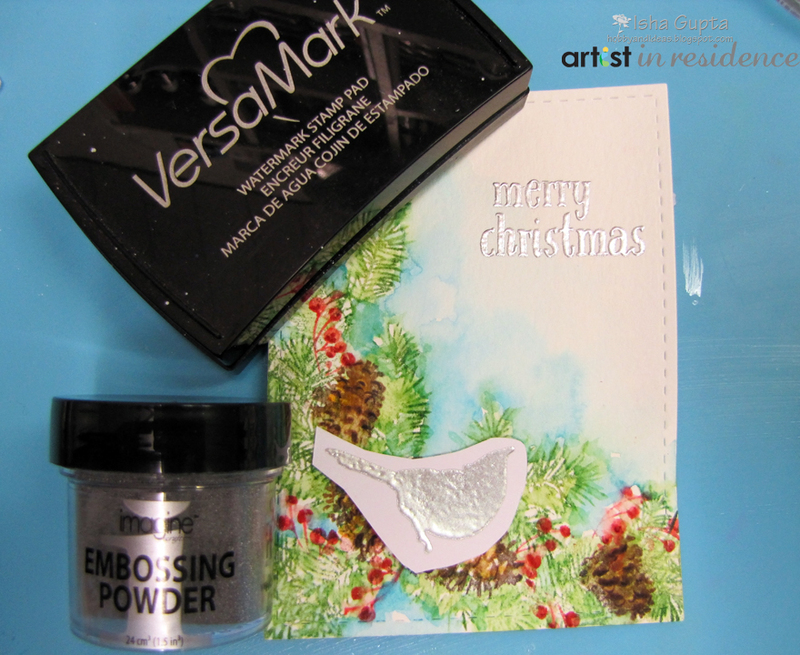 Stamp the sentiment and bird with VersaMark and heat emboss with silver embossing powder. 5. Fussy cut the birds. 6. Adhere the watercolor to the foil paper. Use 3D foam to adhere the panel to the card. 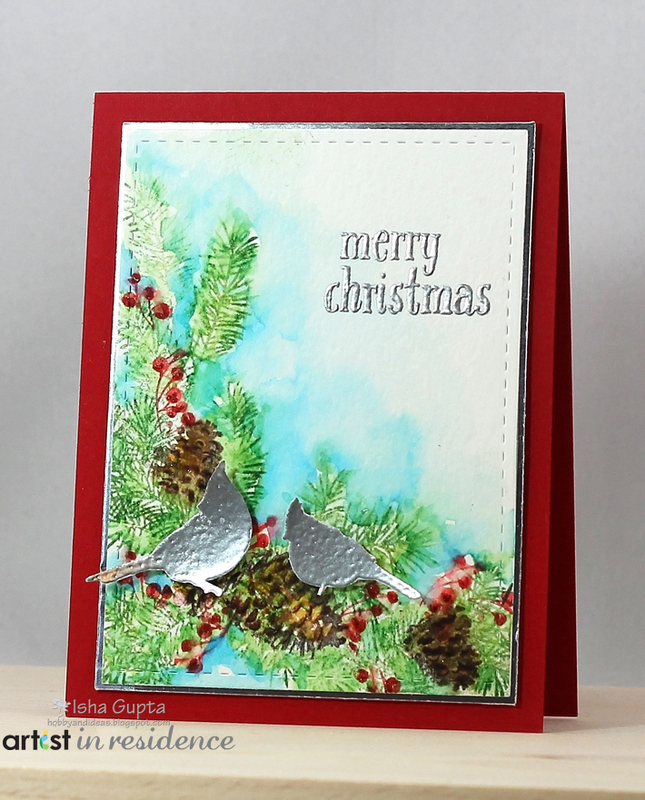 Use 3D foam to adhere the birds to the card. This entry was posted in Cards, Isha Gupta. Bookmark the permalink. Must get this stamp set! This is gorgeous! TFS!